So if you saw my blog Thursday, you know that I photographed one-week-old Charles, born to parents Leymis and Kavin. Here’s a bit more about that shoot – with a bunch of photos, of course! Leymis and I have been in touch for years through work, and I was very happy to get the opportunity to capture the arrival of her little guy. Although he was due at Christmas (I was eagerly awaiting the news, geared up with my camera for the new tiny man), Charles had other plans and decided to join world outside of his mama’s cozy womb on January 12. I photographed him when he was exactly one week old. He was a tiny peanut (even being three weeks late), but he was alert and wriggly beyond his years (or days)! While I’d envisioned a blissfully sleepy newborn, I got a wide-eyed model who stared me down as if he were saying, “Yep, I know what I’m doing.” But how they keep you on your toes is part of what’s so fun about photographing babies! And anyway, I do love the expressions of an alert newborn, and Charles looks like he has a lot to think about. Here is my favorite from our little session. Makes me want to scoop him up every time I look at it. I photographed adorable one-week-old Charles (and his Mohawk!) the other day. More from the shoot to come, but for now, here’s a preview image. Thanks, Leymis and Kavin, for letting me snap some photos of your new little man! 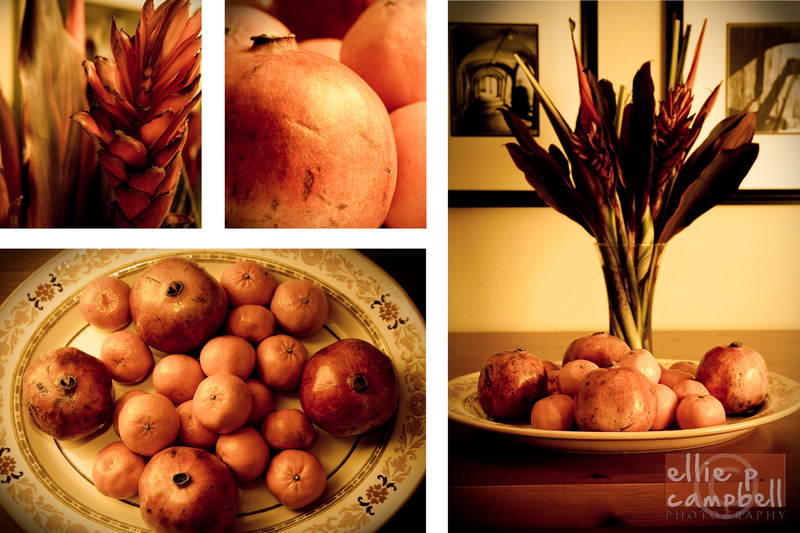 I was inspired by the platter of pomegranates and clementines on our dining table – the colors on the platter complementing those in the fruits, the tropical flowers (thanks, Nikki!) set next to the platter, and the stark black and white photos on the wall behind them set as a contrast to the other, colorful objects… and out came this still life with a bit of a vintage feel.